Pharmaceutical manufacturing presents a diverse work environment with some unique challenges when it comes to ergonomics. Current Good Manufacturing Practice regulations are the primary focus, and often, there is less emphasis placed on how equipment will be used and who is using it. To compound the problem, operations and equipment are not easy to change or modify once approved and installed. 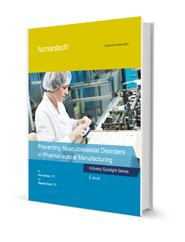 To help you navigate through these and other challenges in the pharmaceutical industry, this e-book provides you with core elements needed to identify and prevent the causes of musculoskeletal disorder injuries. Take a methodical approach to identifying and controlling exposures to MSD risk factors, and rely on ergonomic design before relying on behavioral and work practices changes.